Saxophone master and composer Michel Nirenberg returns to the United States for his 2016 fall tour. In October and November, he’ll share the vibrant melodies and rhythms of his native Brazil with world music and jazz fans in the Maryland cities of Laurel, Baltimore and Annapolis and in Washington, D.C.
Nirenberg first came to the U.S. to attend graduate school. After earning many awards and an undergraduate degree in Brazil, he earned a master’s degree in classical performance from James Madison University in Virginia. Before returning to Brazil he released his first album and joined the roster of Jazz Beyond Borders artists. and Fernando Saci on percussion. Also in the lineup are Argentine guitarist Dani Cortaza and American musicians: pianist Tim Murphy and bassist Mike Pope. Listeners will hear selections from the album and exciting new compositions and arrangements meant to introduce American music fans to a wider range of Brazilian jazz and instrumental music styles. Nirenberg’s composition “Faith,” mixes baião, partido alto and maracatu rhythms. Another recent and deeply spiritual composition, “Bahia de Todos os Santos” is an Ijexá, a rhythm from the state of Bahia in the northeast of Brazil. Bahia’s capital, Salvador, was built around Todos os Santos (All Saint’s Bay). Salvador was a major port in the slave trade. Nirenberg respectfully introduces and ends the piece with a traditional capoeira chant and percussion solo. In this tour he’ll cover “Espinha de Bacalhau,” one of Brazil’s most popular and recognizable choros, written by the great Severino Araújo in 1937. The title, which means "a fish spine," refers to it's up tempo speed and technical difficulty. Fortunately, his team of international musicians is clearly up to the task! 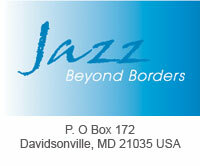 Visit the Calendar Page of http://www.jazzbeyondborders.com for details and artist website link.